Ferg Family Adventures: The Biltmore at Christmas! Last Saturday, Travis and I drove to Asheville to visit the Biltmore! My sweet friend had bought us a gift card to use there as a wedding gift, since it is where we got engaged! I really wanted to visit at Christmastime because they decorate it so beautifully, so that is what we did!!! So if you've never been to the Biltmore, the bad news is that they don't let you take pictures inside. Well, too bad! However, Travis convinced me that if I got caught, we were going to get thrown out and that there were security cameras everywhere to catch me....So I had to be extra-sneaky and took these two crap-tastic iPhone pics. Come arrest me. After we toured the house (which after all of the beautiful decorations on the first floor, the rest of the tour was a little boring because we had already seen everything and the rest of the house was not very decorated...), we went up to OUR balcony (yes, we own it) where we got engaged! Ok, sorry...I overdid it a little bit with the balcony pictures. I got excited. Sorry, I'm not sorry. I kinds wish we had gone at nighttime to see the big tree out front all lit up....next time??? After we left the house, we still had a little bit of $$$ left on the gift card, so we hit up the winery! We unfortunately didn't do a wine tasting (we had a Christmas party to attend that night and knew we'd have more than enough wine there! 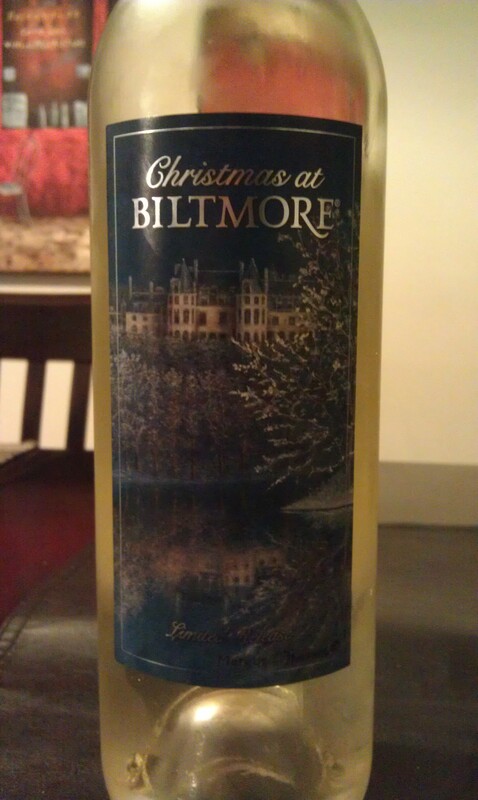 ), but we did stock up on our Biltmore Christmas wine! I got a little excited about that! Haha. Anyways, we would have stayed longer, but we had to get back to Charlotte to go to Travis' work Christmas party, which I will blog about soon (it was so eventful, it gets its own post! I know you are excited....)!!! How much FUN! I love the Biltmore at Christmas ... I have been twice now. Once I did the candlelight tour which is so nice -- really puts you in the Christmas spirit. We were there three years ago and it was such a highlight of the season.